For the best experience, take the time to try interacting with all the objects, too! So, at first I wasn't sure how I could motivate myself to participate again, because I can only really get into it and make something amazing when my heart is in it. Nearing the date of the jam, I got the bright idea that what I most wanted to do right now was make a game about Nora, so no matter what the theme was I would find a way to shoehorn Nora into it. Nora is my mascot character. She was thoughtfully designed ahead of time to be the epitome of adorable innocence. The large art at the top of the post is actually a piece of rough concept art for her that I worked together with an artist to produce, and it actually took a bit of work to get her to where she is today. 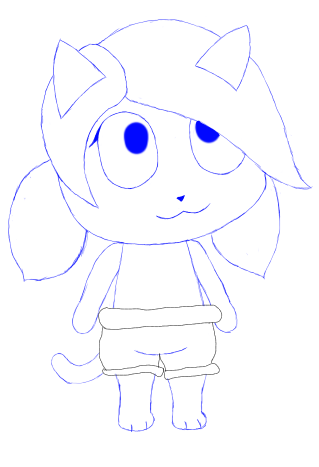 I had been meaning to flesh out her world and create additional characters to play off of her personality for a while now, and I figured the jam would be a perfect way to motivate myself to get something out there. 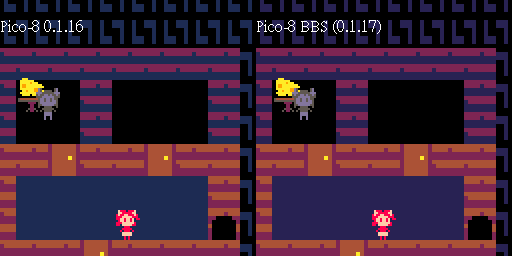 I was actually hoping all along that I'd get to make an RPG, because RPGs are rare on the Pico-8. When jam theme voting came up, I cast a dual vote for Blob and Useless Power-up. That way, if Blob was selected, I would benefit by having standard RPG slimes to fight against (and cute moe blobs for characters!) while everyone else foolishly used the built-in circle tool to try and do wacky blob physics games. And if Nora gets a Useless Powerup instead I could easily make that an RPG McGuffin of some kind... So either way I'm good, right? With that settled, I began work on pixel art. And then the jam turned out to be about Chain Reaction. Crap. How am I supposed to make these 16x16 pixel overworld walking catgirl sprites into the embodiment of a "chain reaction"? At first I doubled-back, thought I could change my design into another charming but simple puzzle game where you place a dog to move forward and scare a cat, which moves away from the dog to scare a mouse, which moves away from the cat to collect the cheese... That's a puzzle game, right? I have vague memories of a puzzle game like that actually existing at some point, but I couldn't remember the details to really make it work... It would be boring to make a puzzle game if I can't figure out any intricacies to make it require some thought! 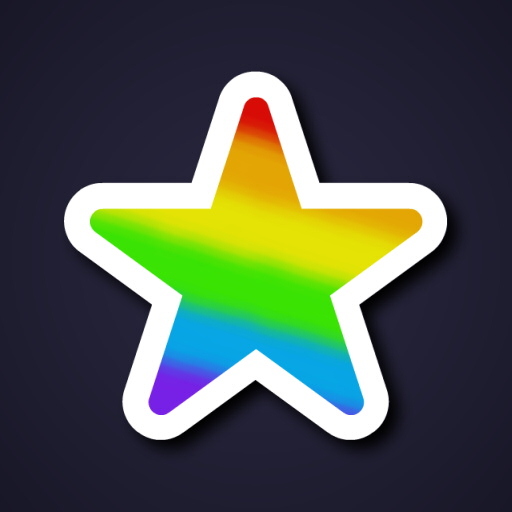 At any rate, the first early alpha version went by this design (see "Earlier versions:" below), hence the little info box which is now missing from the current version of the header image. Uh oh. It looks like someone else had the same idea as me, and they seem to remember the rules better than I do as well. It was a game about using a mouse to scare an elephant into a cage or something, right? 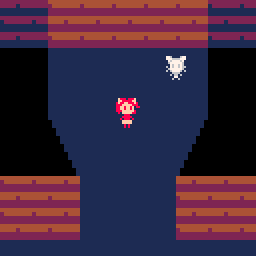 Well, since I don't want to risk my jam entry being redundant and I don't remember how to make that fun anyway, I'm back to figuring out how to make an RPG with a "chain reaction" twist. The results became the finished product: A battle system where instead of selecting the attack you want to use (so that you can just spam the enemy's weakness over and over), you have to figure out how to connect multiple attacks together into a big chain to deal significant damage. My fatal mistake was trying to keep the overworld aspect of the game, rather than just focusing on the combat system. Because this project was still about fleshing out Nora's world, which was important to me. I already had sprites for all four directions set up, so it would be a waste to throw them away changing my plans again, right? I ended up working obsessively, pouring hours into this project all week long, slowly adding more dialogue, more rooms, more scenery objects... Then I realized my second mistake: The combat system is like nothing anyone has ever seen before, so it needs a full proper tutorial before people will grasp how to use it. And if you don't know how to play, you can't win the game. I ran out of tokens. Oops. So, the finished product ended up having only two battles (I had planned a third, final boss, with gimmicks and a true ending) and thus was very light on gameplay despite being packed to the brim with solid content. If I had instead only made the combat screen and cycled through enemies randomly (including recolors), I could've had potentially endless hours of gameplay. Instead it's something short and cute that you play once and never touch again, much like my previous Pico-8 Jam entry, Frog Home. I guess I just love to tell a story. No good display for elemental weaknesses, you'll have to pay attention to the numbers. There was supposed to be an optional final boss with some gimmicks that I couldn't fit under the code limit, let alone write another ending for. If the ending feels wrong, that's partly why. I look forward to playing the finished product~. Pico-8 crashed on me and lost my work, too. The audio bugged out right before it happened, it really surprised me. But I managed to get a new demo up anyway. Work continues. I approve of the cheese pun. And yeah never fun when you experience a surprise program crash right in the middle of working. Started working on the overworld map and transitioning from one room to the next today. Please add instructions in the description. Thank you! This looks AMAZING. It's like old-school Pokémon Red/Blue with mouses .-. Hope you finish this soon, can't wait to play the final version! I came for cute animals, but I stayed for adorable attack animations. Finished! 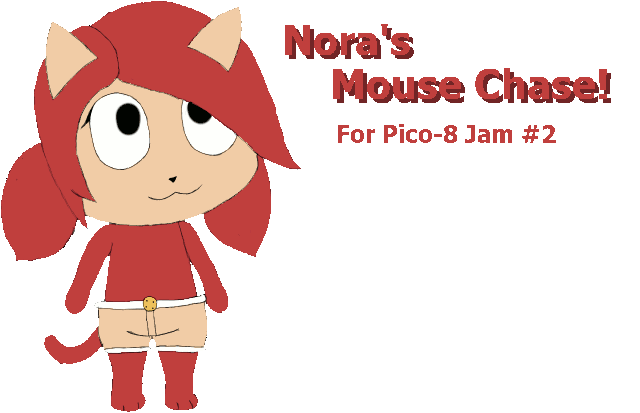 Barring any minor issues, this will be my final version of Nora's Mouse Chase. I've used up nearly all of the tokens, so adding anything more will require some code refactoring and optimization or converting certain effects from efficient lines / rectangles into sprites. This must be what it feels like to suffer color corrections in Special Edition rereleases of your award winning movie. Fantastic little game! The battles were much more fun than most other similar games as you have to actually think about them. Played through to the end which left me wanting more! Rebalanced MP costs and changed the skill mechanic to disallow using multiple skills in the same turn to stack the effect unfairly. You should now be able to use "Convert" skills only 2 times per fight (down from 3) and then still have enough MP left over to use Full Random once or Shuffle Next 4 times. Convert skill targetting was refined some more to use link elements as a tiebreaker, in case you have two pairs of elements to choose from, guaranteeing the best possible effect. Minor tweaks to some of the wording Numo and the tutorial use. Keys now tell you that the door is automatically opened when collected. Changed Numo's sprites to closer reflect the intended hair style. 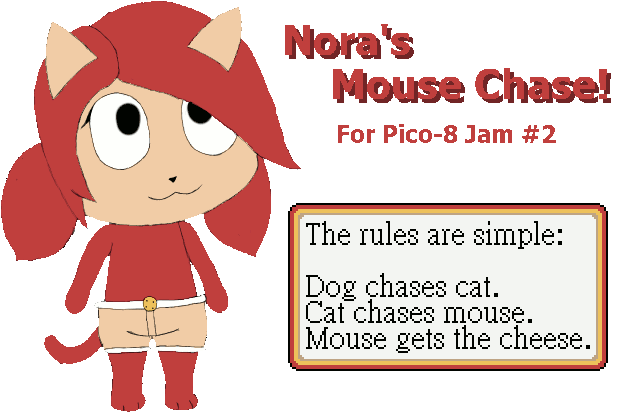 Added Nora's info card to the end of the tutorial. Awesome game! Graphics and transitions are awesome too! The whole rock paper scissor battle system is very nice, the music is pretty catchy too. Great Job! Very good game. The style is good and the story cute. I was a bit confuse, as I always expect the chained element to take a part in the fight. Keep up the good work. Great gameplay! Not a fan of the graphics, but the battle system is really good. And it's awesome that you had time to add this sweet and complete tutorial too. Yeah. I opted for a very low color style on the main sprites for some reason. Like it's supposed to be an NES game or something. And then all the overworld tiles are scaled up to make you feel tiny? But then the scale changes when you go through a door like in Pokémon. I really liked the battle gameplay once I got the hang of it - solid job! It was a bit short, but it still left a lasting impression! Nice job! Yeah. I didn't use any fancy compression techniques and cut a lot of corners in my coding to get it out the door in time for the jam, so the game became that short because it's more or less all I could fit under the token limit. I should've probably just made it a continuous battle-after-battle arena simulator with a bunch of random encounters if I was smart, maybe even with a balanced 2 player VS mode, but it wouldn't be as enjoyable to me if it were presented without context, with no story... I wanted to impress people by presenting several distinct screens of gameplay, rather than just a title screen and a static game screen that always does one thing and never changes. If my cute little overworld with all its flavor text and the cut-in tutorial screens also left an impression on you and added value to this project beyond just the memorably unusual combat system mechanics (which required the detailed tutorial to explain), I'd consider it a success. I like this, very polished and a well executed dialog system. Love the battle animations and the actual combo mechanic. Am I right to think there's only one battle after the tutorial? There's two and an ending, you just need to collect keys to open the doors. In that case I need to play it again! 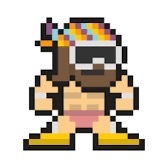 Congratulations to Combo Pool for winning Pico-8 Jam #2. It was well-deserved. I've added some developer commentary / afterthoughts to the first post, as I did after Pico-8 Jam #1 ended for Frog Home. Do you think you'll ever revisit this idea in the future or would you rather move on? The battle system is really interesting and fun to play with and I would absolutely love to see it being expanded upon. You can actually press Down at any time to select the Launch button, it only auto-highlights if you successfully chained every card. I manually upscaled one of Nora's 16x16 overworld sprites to 128x128 for some reason. Wow, great job, JTE! The game was fun and nicely done!